The grand prize is a Kindle Paperwhite filled with 43 electronic books! For a chance at the grand-prize, be sure to enter here Love Struck Entry. I am also giving away a free electronic copy of Highland Solution to a randomly selected reader who leaves a comment on my blog between February 9th and midnight on February 14th. If the winner already has a copy of Highland Solution, that person will receive a copy of Highland Courage on its release day instead. I have been featuring a “Month of Courage” on my blog in anticipation of the March 3rd release of Highland Courage, the second book in my series of medieval Highland romances. Acts of courage can be bold and heroic, like rescuing someone from a burning building. But often courage simply involves overcoming a fear. Highland Courage tells the story of Mairead Mackenzie who must learn to overcome her fears with the help of the man who loves her. Sometimes courage simply involves taking the first step. Don’t be fall’n in love as she’s walking away when your heart won’t tell your mind to tell your mouth what it should say. That shouldn’t be so hard, but we all know it is. All of our doubts and insecurities creep in. What if she turns to her friends and laughs? What if he says no? What if I trip and fall on my face walking across the room? What if–? You fill in the blank; I’m sure it is easy to do because the “what ifs” are endless. So, have courage my friend! Whether you want a dance, or a date, or a partner for life, don’t let the opportunity pass. Gird your loins and summon up the courage to ask. 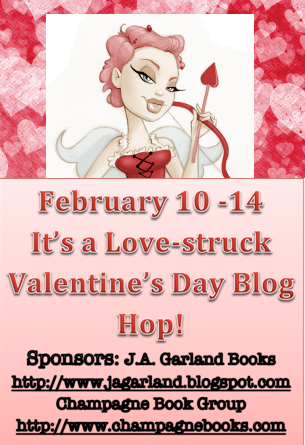 Don’t miss the other stops on this blog hop for the chance to win other great prizes. cjlps23 Don’t let Valentines hype get you down! It’s a greeting card day and frankly more men ignore it than do anything sweetly romantic in my opinion. Make it special for yourself. Plan a spa day and treat yourself or maybe have a little party with other single friends. Oh and if you like historical romance, you might like the other contest that I am involved in. Click on the Scottish Affair Scavenger Hunt link. So true. I wouldn’t have written a novel, found a publisher and you wouldn’t be reading this right now if I hadn’t taken. But the fear of rejection or worse, ridicule can keep a lot of folks from following a dream or simply asking for a dance! I agree. Thanks for the chance! I think we all need some extra courage in those moments! Thanks for the chance to win! Yes we do! Good luck in the drawings. I think all of us are afraid of being embarrassed or being rebuffed. I agree Linda. When my kids were young and attending school dances, I always encouraged them to dance at least once with someone who summoned up enough courage to ask. I suppose in today’s world, outside the safety of a school dance, I wouldn’t want my daughter to dance with someone who instantly made her feel uncomfortable, but generally I think it is a good policy. My brother met his wife at a college watering hole when after three weekends of seeing her, he finally asked her to dance. Of course, she kept coming back to the bar after seeing him the first weekend, hoping he would ask her to dance. The third time though, she had decided to give up–if he didn’t ask her, she wasn’t going back again. If he hadn’t finally summoned the courage that night, he might never have seen her again. Lovely post, Ceci. I think fear of looking like a dork holds many of us back when we really shouldn’t care. To many times doors have closed. You just have to have the courage to continue opening doors until the right one is opened. Unless we gather our courage and act, the answer will always be no. Which is worse – embarrassment, or maybe a gentle rejection, or lonliness and regret? Great post. Fear can keep us from experiencing a lot in life. What an inspiring post! We all need a little courage in our lives. Thanks for sharing. Happy Valentine’s Day! One of my most favorite reads is Scottish Historical. I am currently reading Highland Solution am greatly enjoying it. I can’t wait for the next one to be released. It will be a real treat. I am so glad you are enjoying Highland Solution! Thanks for the kind words. Congrats on your upcoming release! It sounds like a wonderful story. I picked up Highland Solution and can’t wait to read it! Thanks Tina. I really hope you enjoy it. Please let me know. What a great post. We all should take more chances.